The panko makes the shrimp light and crunchy. This is a great appetizer for a dinner party; or in my case, for a main dish! 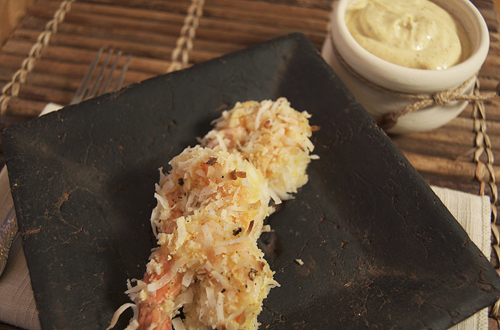 The curry dipping sauce combines with the shrimp to give a delicious coconut curry flavor. If you have never eaten coconut shrimp, this is definitely the recipe to try. In a large bowl, refrigerate and soak the shrimp in the coconut milk for 30 minutes. Preheat the oven to 400F. Dry shrimp on paper towels. Get three medium bowls; fill one bowl with 1 cup flour, one with 2 whisked eggs, and one with 1 cup panko, ½ cup flour and 1 cup coconut (mixed). To prepare the shrimp, coat in flour, dip in the egg wash, then roll in the coconut mixture. Repeat with each shrimp. Place all of the shrimp on a foil-wrapped baking sheet. Bake at 400F until golden and crispy (about 15-20 minutes). To make the curry dipping sauce, whisk together the mayo, sour cream, curry powder, cayenne pepper, onion, salt and pepper. Shopping at thrift stores for food photo stuff is so much fun! What great finds you got! The shrimp and dipping sauce sounds and look wonderful! I love coconut shrimp and your dipping sauce must be so tasty with the shrimp! I like to shop at thrift stores. Looks like you found some good stuff. I have eaten coconut shrimp before, but this still looks like a great one to try. This really looks tasty! Yep! But baked so they are healthier! What a smart idea! I never thought of looking for food props at thirft stores. This sounds and looks delish. I can’t wait to give these a try – thanks for the share! I love shrimp. It’s like your taunting me – because Handsome hate’s them and I hardly ever get to enjoy home made shrimp awesomeness. These coconut shrimp and the curry dipping sauce sound sooo yummy. I never even though to shop at thrift store for kitchen stuff…such good idea, I want to go out right now and start looking! The shrimp looks awesome, too!